Amazon deforestation is down by 16% in the year to July 2017 compared to the previous 12 months, the Brazilian government says. 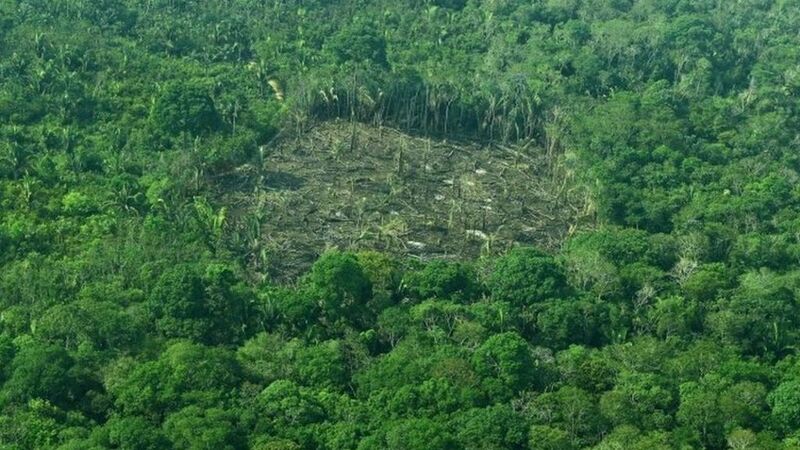 Satellite date suggest 6,624 sq km (2,460 sq miles) of forest were destroyed, down from 7,893 km sq in 2015/16, Environment Minister Jose Sarney Filho said. But the figure is still above Brazil's climate change target. Mr Sarney Filho cited stiffer controls and more agents on the ground. "When the illegal loggers know that [officers of] the Brazilian State are on location, they diminish their activities," he said. The size of the deforested area from August 2016 to July 2017 was four times that of Brazil's largest city, Sao Paulo. Taken state by state, the picture was mixed. While deforestation diminished by 55% in Tocantins state and by 43% in Roraima, it rose by a massive 86% in Amapa, according to the satellite data gathered by the Programme for the Estimation of Deforestation in the Brazilian Amazon (PRODES). Amapa is the state where the National Reserve of Copper and Associates (Renca) is located. There was an outcry in August, when President Michel Temer signed a decree opening up parts of the reserve for mining. A court blocked the move and the government revoked it in September. Mr Sarney Filho said that while the drop was welcome news, a change of attitude was needed for a more lasting change. "Surveillance and control help, but it is not a solution," he said. "We will only end deforestation when we value the standing forest." Some environmentalists have cast doubt on whether the drop is caused by government police. Paulo Barreto, a senior researcher for non-profit Amazon institute Imazon, told Reuters news agency that Brazil's economic recession and a drop in livestock prices were probably the major causes of the decline. Ranchers clearing forest for cattle are major contributors to deforestation.